I couldn't care less about the latest Superb Owl, if you keep in mind where I live, you'll easily understand why...and, anyway Thee Oh Sees put on a better show than that creature appearing at halftime. Started to video, but had a feeling part way through Contraption I wouldn't be able to remain sitting off to the side but would be in the thick of it, which was about right. So into the breach I went...you might spot my balding pate in the YouTube of Block of Ice if you know who to look for. Lots of people at the back of the stage watching and hanging out, so this definitely had the hometown show vibe...and I thoroughly enjoyed myself. Some idjit (heh, me!) kept calling out for "Corrupted Coffin", even if that person should very well know that the band had only rehearsed it a few times, two of which appear on the latest releases. As good as the Castlemania version is, the one on the TOS/Total Control split (which I can't find online, alas) simply is one of the most astounding songs ever to clock just over a minute. I did call out for "Meat Step" at the right time, so JPD kindly obliged, after stating the setlist was in the other room (meaning that's what they were playing anyway, of course. Any help id'ing the last track...it was a slow, old style number...would be most appreciated! 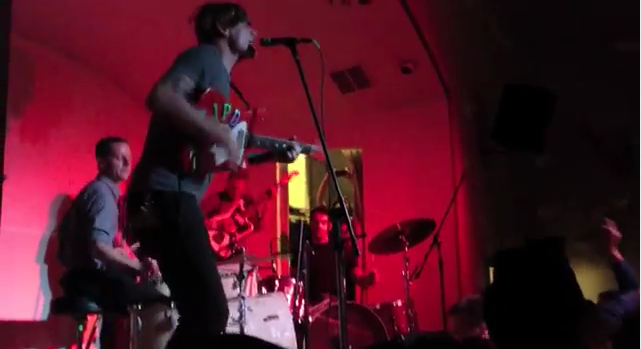 The last song in the set was just played again during the Pioneertown show, look like it's called 'Minotaur'. Thanks for the confirmation, Anon...hope it's one they do tackle one day...just as I hope they play Corrupted Coffin live. I asked Mike Shoun about that and he said it's one they've only rehearsed a few times.